We are all encouraged to switch to more energy efficient light bulbs and, apart from the lower energy consumption, they offer an interesting benefit - new designs for lampshades. As the low energy bulbs generate very little heat, a wider variety of heat sensitive materials can now be use for light fittings, particularly plastic which would have melted if placed close to the old stye incandescent bulbs. Someone who has grasped this opportunity with both hands is designer Sarah Turner. She makes beautiful light fittings from recycled plastic bottles. The lamp shown here is from the ‘Lily’ range which are made from either 9 or 12 two litre drinks bottles. You can buy them on their own or with a table lamp base. 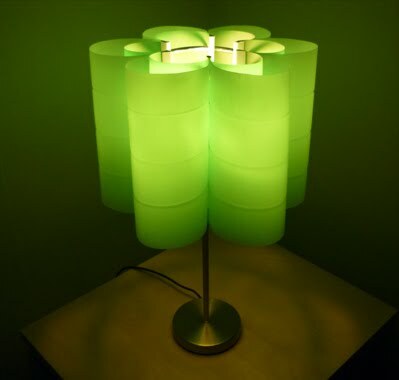 The Sprite bottle's colour makes the inside sections green with the outside white, but when switched on these colours seem to reverse and make the lamp truly stunning! Also available in plain white in both sizes. Sarah has just been shortlisted for a competition over at Inhabitiat.com so, if you would like to make her day, you can vote for her here : and then simply click on the green leaf vote symbol at the top of the page.